You’re looking at all kinds of independent contractors utilizing the ever-popular and timeless “clipboard.” It’s professional. It’s sleek. It’s simple. It allows the independent contractor the ability to stay mobile and collect information all at the same time, but here’s the thing: there’s a lot of competition out there. So what sets you, the independent contractor, apart from the rest of the pack is the brand name. You Place It on Your Custom Clipboard. Any Independent Contractor Will Benefit Business By Branding. You name it…. Even lawyers! Professionals don’t realize that when customers see you outside a brick-and-mortar store, they need to see something identifiable. Why not identify with them on something you always carry around? 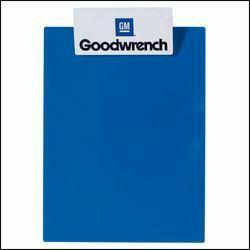 A custom, branded, printed clipboard. That’s the game changer. Once you purchase in bulk any amount of custom clipboards to use while doing your business, you can then use them over and over again. It’s an immediate investment that’ll last the lifetime of your business. BRAVA Marketing totally agrees. This is why it’s crucial that you check all the designs we have for promotional clipboards, and see what fits your style. You could be any other independent contractor out there — and chances are, you’ll need that clipboard anyway for the work you do. Organization. Professionalism. That clipboard just about solves every issue you might have if you didn’t have one to help you just write ‘stuff’ down! Contact us at BRAVA Marketing and get started. You’ll learn of many other ways to utilize custom clipboards, too, right here. In fact, grab your own clipboard and go ahead and take notes! Talk about some real effective business practices you have….